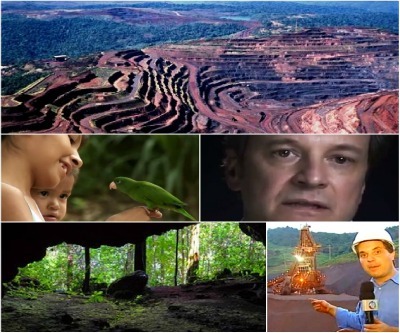 World number one iron ore producer Vale over the weekend "played down fears" that the planned expansion of its Carajas mine – a truly gargantuan project that will see the Brazilian giant commit almost $20 billion over the next few years – would harm the local Awá tribe. AFP quotes Survival International, an indigenous peoples rights group, as saying the Brazilian firm's plans to have trains as long as two kilometres run in both directions to its port in a remote northern section of the Amazon forest will only increase the pressure on the surviving members of "Earth’s most threatened tribe". A Brazilian government survey cited by Survival International estimates there could be “up to 4,500 invaders, ranchers, loggers and settlers” occupying just one of the four territories inhabited by the Awa, whose total population stands at no more than 450. In the film, the Oscar-winner says: "The Awá's forest is being illegally cut for timber. When the loggers see them, they kill them. Their bows and arrows are no match for guns. And at any other time in history, that's where it would end. Another people wiped off the face of the Earth, forever. But we're going to make sure the world doesn't let that happen." The area also hosts some 2,000 caves that scientists regard as "potentially precious features" because of the high incidence of iron and unusual biology: "One cave descended into hosts four species of bat – only one of them carnivorous, luckily – and excavations in its floor have revealed evidence of human habitation as long as 9,000 years ago" according to a BBC report. The operations manager of the mine, Jaymilson Magalhaes, tells [the BBC] that the mine complex only covers about 3% of the area of the national forest and that before any digging can start, the company has to have a restoration plan to return the area to its original state. That includes using spoil to fill in the mines once they are exhausted to reshape the topography – a process we witnessed in one small area – and undertake a massive replanting programme using native species. The chronically understaffed Brazilian conservation agency only has 12 rangers in that area of the Serra Sul Amazon region "but Vale pays for a further 80, plus cars, boats and the use of a helicopter, all vital to guard against illegal logging and poaching." According to The Guardian, Ibama , Brazil's environment agency, "has fewer than 1,000 officers on the ground at any one time across a country nearly four times the size of western Europe". Vale (NYSE:VALE) was granted a preliminary environmental license for the lowly-named "S11D" mine in June. The Carajas complex is the largest iron ore deposit in the world with 7.2 billion tonnes in proven and provable reserves – that's a more than $800 billion contribution to the Brazilian economy at today's prices. S11D would not only lower Vale's overall costs at the operation, but improve the average quality of the ore it mines. Vale said in a statement that it plans to spend $8 billion to develop the mine and build a new processing plant, as well as $11.4 billion to expand the railroad and local port to allow it to ship the steel-making ingredient to important markets in Asia using its massive Valemax carriers (400,000 deadweight tonnes). To ameliorate the planned works' environmental impact, Vale said it would transport iron ore from the mine to the processing plant via 37km of conveyer belts instead of using trucks. At the moment the mine mills 300,000 tonnes per day. The Rio de Janeiro-based company added S11D would produce 90 million metric tonnes of iron ore – adding some 30% to Vale's current output – and begin operations in 2016. This week Vale's earnings came in at $2.7 billion, down 59% from $6.5 billion in 2011 and its lowest level in more than two years. Profits sank 30%.